The 2018 HSNCT is now in the books and we have capsule recaps for all the PA schools who attended in order of their finish. Remember: there were 352 teams at the tournament, that this tournament required qualification by finishing in the top 15% at a NAQT tournament during the year, and that there are several thousand schools out there across the U.S. who competed in quizbowl this year. Stats for the full tournament can be found at this link. The victors were Plano West (TX), who defeated two-time incumbent champ Hunter College High School (NY) in the final. This year marked the 20th HSNCT. D-STEM getting ready for a match en route to their Top 10 finish. Comments: STEM lived up to their billing at this event with two outstanding wins over national powerhouses. They finished in the top 10 for PA’s best finish since the 2011 State College team. True to form, Vishwa played high-risk, high-reward quizbowl and mostly succeeded, with 65 powers to go with 45 negs, while Anish and Rohan both added a solid 17 PP20TUH of support. Comments: Alex Schmidt ends his NAQT playing career with a pretty incredible performance of 78 powers against only 29 negs, easily taking the individual scoring title for the tournament with 127 PP20TUH. An early loss against Hunter A may have been one of the best-played and highest-scoring games in modern HSNCT history with 910 combined points scored in the 305-605 loss. Yet again though, the old rule of national championships (at least at the high school+ level) rears its head: it’s very hard to make a deep run or win a national title without a full team and LV never quite got a supporting group to complement Alex’s skill set. Comments: Allderdice has gone from a good regional PA team to one of the best in the state and region, a testament to how much hard work and studying can pay off in a relatively short amount of time (esp. from lead scorer Jamie whose 37.5 PP20TUH came from someone who hadn’t begun playing before this school year). Claiming a W over DCC A is an extraordinarily rare feat in quizbowl and though DCC eventually got its revenge in the playoffs, Allderdice may have the last laugh in the future with all of its players other than Jamie coming back. Fear the dragons next year. Allderdice with their T-12 trophy. Comments: Youth triumphs over experience with State College’s freshmen and sophomores actually besting their A team’s finish. SC B also saved its best for the playoffs, winning against two veteran teams in close matches before bowing to Canyon Crest (CA)’s B team. Albert’s 53.62 PP20TUH made him far and away the best freshman in the field at the tournament and the rest of the team all made strong contributions. Although the Gittings era at State College continues to recede further into the past, the Zhang dynasty looks poised to continue its newfound prominence within the the Central PA and state circuit. Comments: This year’s Township A team did a nice job of making improvements across the course of the whole season and all of its players adapted well into the trademark well-balanced, disciplined MT A team. Continuing to make the playoffs at HSNCT and picking up a win over a strong opponent is something pretty much every team in the country would like to be able to do, and this year’s MT A team kept up that tradition. Comments: FSS A’s talented duo of Richard and Jake capped off their playing careers with a strong run to the playoffs that ended with some particularly tough matchups in the final two prelim rounds and their playoff rounds. Richard (45.45 PP20TUH) scaled particularly well to the higher difficulty of the questions but all of FSS A’s members did their parts to make the playoff run they’d been eyeing for the past few years and sending 2017-2018 PA Coach of the Year Abbi Smith off with a playoff win. Comments: State College A played a remarkably well-balanced roster this tournament with all its team members scoring from 18 to 25 PP20TUH and all getting their moments in the buzz. They had a very good run in the middle of the prelims, beating several strong playoff teams, but quieted down a bit on Sunday. Given the replacements available from the B team, SC A should look to be around Sunday afternoon next year as well. Comments: After finishing Saturday down 3-4 and needing to win their next 3 straight prelim games to make the playoffs, D-East not only did that but added a commendable playoff win as well. Despite a somewhat remarkable aversion to powers (only 5 for the whole tournament compared to 100 regular toss-ups), D-East should be proud of sending their senior-heavy team off with a win, though they will miss Jackie’s 51+ PP20TUH next year. Comments: An impressive number of powers (39) was enough to get Henderson A into the playoffs but not enough to get them farther. This is the team’s second playoff performance in three years. A tough playoff matchup ended their tournament a bit early, but they do have the solace of leading scorer Vijay (35.5 PP20TUH) returning. Comments: Knocking off Princeton HS to make the playoffs by 10 points is probably one of the best ways to make the playoffs, even if Shady Side’s stay in draw was short. This all-senior team was paced by Will (40 PP20TUH) and Fuad (30 PP20TUH) who got to end somewhat underrated Western PA careers on a high note. Players from Pennsylvania in a “How to Play Quizbowl” video that NAQT filmed on site. Friends Select, Downingtown East, State College, and Great Valley are represented. Comments: GV A got hit with 7 (!) playoff teams in the course of their prelim schedule including some of the inevitable unbalanced (e.g. 4-2 vs. 3-3 record) matchups and had 3 losses on the final tossup. Tough breaks for this group of seniors who cut back considerably on the negs and got a nice win over SSNCT champs Glasgow as well as keeping it very close against Clark (NV). Comments: The Alagars reached the heights of a 5-2 record on Saturday with wins over several playoff teams including eventual 20th-place finisher East Chapel Hill, but then crashed on Sunday, losing 3 matches in a row to finish out of the playoffs. It was always tough to place the Alagars given their relatively infrequent playing schedule, but Western PA quizbowl will lose a strong competitor and a bounty of history knowledge as all of the current Alagar players are graduating. Comments: Penn Manor’s first return to HSNCT since their 2013 debut went about as expected, with lots of solid all-around play (and a solid 14.9 PPB) that kept them in matches but couldn’t quite put them over the hump of the playoffs. Connor’s 63.8 PP20TUH was pretty impressive scaling of knowledge to the HSNCT difficulty and will be an excellent building block to build on in future years, but the rest of his teammates also contributed both a decent number of powers (7) and a surfeit of negs (30). Comments: The youth of Great Valley look like they’re nicely prepared to step into the roles of their A team next year. There will be similar stories with many of these other B teams as none of the PA schools other than State College really had a B team as a threat to make a playoff run (this year at least). Comments: This team made it to a .500 record, but had a fairly manageable schedule with which to do it against mostly 3-7 teams. With the opportunity for a marquee win against Santa Monica A that could have vaulted them into the playoffs, they weren’t able to make it happen. Comments: Similar to the other B teams on this list outside of State College, MT B gained valuable hard-question and NAQT-style experience while not making too many waves. The ranks of MT A will be replenished with veterans now. Comments: FSS B cleared the playing cupboard with six players all contributing on this team. Five of the six will be back next year for FSS. Friends Select’s departing coach, Abbi Smith, with her PA Coach of the Year award. Comments: In a welcome return to HSNCT after many years (NWPCA attended some of the first HSNCTs ever in the late 1990s), NWPCA put in a respectable performance, actually out-powering a strong Darien A team in the first round. Their top three scorers will return next year and we’d love to see NWPCA attend some more local tournaments as well as HSNCT then. Comments: Plaudits to Emmaus for venturing back to HSNCT after a few years away, but they did seem to tire a bit with their PPB going down considerably in the final few preliminary rounds. More local tournament experience could prove valuable for them in future years, though they lose a good bit of their scoring including Ben (~40 PP20TUH). Comments: Wallenpaupack came back with distinctive purple team shirts, but their scoring was down compared to last year. They might want to work on that 9-21 Power-to-Neg ratio in the future. Comments: Vince (32 PP20TUH) and company got to cap off their HS quizbowl careers with a solid performance. They also won a close 26-TU overtime match against Detroit Country Day B, 165-155. Comments: After losing star player Brandon to graduating last year, Mennonite’s rebuilding year went about as expected, though they did this with a very young roster who should be a good platform to build on in future years. They also succeeded in baffling the non-PA teams with their geographic location. Comments: Armstrong made their non-league weekend tournament debut at HSNCT and after taking some lumps in the first few rounds put together a few wins in the later rounds. We’re glad to see Armstrong coming down to HSNCT, but we also hope they can attend some more tournaments closer to home in Western PA in future years. Comments: Jim Thorpe is one of the first of what we hope will be many more teams from the various Scholastic Scrimmage shows making the leap over to more quizbowl tournaments from the TV show, so we hope that they enjoyed their trip and will come to more tournaments. A group photo taken at the annual PA meetup at HSNCT- which represents only a fraction of the total number of Pennsylvanians attending the event as players, coaches, or staff. It’s worth noting that in addition to all these teams and their many diverse achievements, the Pennsylvania community and its alumni supplied 22 staffers for this year’s HSNCT, which was just shy of 10% of the total staff on site. It’s fantastic that so many people have stayed involved with the high school game after graduating, keeping the game going from generation to generation. We encourage all Pennsylvania quizbowlers to keep the legacy going by helping out at tournaments, from local leagues to nationals, and in mentoring the next generation of players. Overall, this tournament showed that PA teams are not only qualifying and attending more national championships, but also finishing higher as a group than ever before. 3 of the top 20 teams were from PA, which ties PA with CA and TX among states with the most schools in the top 20. There’s a lot of talent graduating this year among PA schools, but also plenty on the horizon that can step up. Out of all the PA teams, Allderdice seems best positioned to make a deep run next year as they bring back a considerable number of their top players and now have the kinds of high-level experience. But given that this year’s HSNCT champions, Plano West, came out of nowhere to topple a lot of the venerable quizbowl dynasty teams, the takeaway ought to be that any given group of four dedicated players can potentially win a national title if they study. We’re still a young circuit and have a long ways to go in continuing to reach out to more schools who don’t play quizbowl or only compete in county academic competitions, but after this year’s performance Pennsylvania won’t be able to use the underdog narrative again. 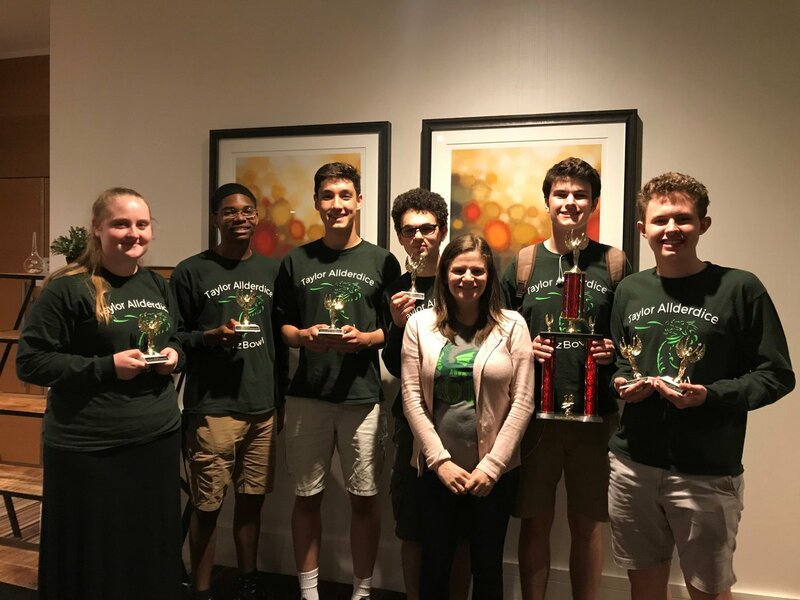 In case you missed it, here is our 2018 HSNCT preview. Ben and Chris breifly discuss some of the format changes, and then discuss the Pennsylvania teams who are going to this year’s nationals. We at GPQB salute all the teachers who sponsor quizbowl teams and want to help y’all coach more efficiently as well as effectively. This post is designed to help quizbowl sponsors ease the burdens of coaching while still giving their players plenty of opportunities to compete and the necessary guidance in improving. You might also be interested in our guide for how coaches can help improve their team; that post and this post are intended as complements. It’s totally fine not to be an active coach all the time. For your typical weekend tournament, feel free to sit in the back of a room and grade or prep lessons for the next week. Check in with your team or teams between rounds, but otherwise let the questions teach your students during the tournament. You can even have your players keep track of the questions they get on their own scoresheet and write down the answerlines that they missed so that you can go over them later. This is one thing that many coaches already do to some extent, but it’s worth mentioning here in detail. Have the students come by after school, before school, or during lunch (whenever you do your practices) and do the work of setting up the buzzers, getting chairs moved around, etc. You might even time them each day to see how quickly they can get it done if they’re being a little lackadaisical. Have a clear system of what packets have been read in the past (some teams write the date in which they last read a paper packet on the front of the packet or keep a Google Doc with what packets have been read so far) and which ones are coming up next. If a NAQT tournament is coming up for instance, then you might want to read NAQT questions that week; if a housewrite is coming up, then you might want to read questions from the previous year’s edition of that tournament. The students can take the lead in organizing this as well and in keeping score. Most of the time students ought to be able to handle rotating reading responsibilities on their own, but you should also feel free to assign a reader (perhaps a newcomer to practice or someone outside the club who wants to help read at a tournament) as well. The main exception to this rule is in the first few practices of the year when you need to pay more attention to new students. This also holds if this is your school’s first year with a quizbowl team and you’re trying to explain concepts and strategies to students. After a year or two of having a team though, the students should be able to pass on this kind of practice-running knowledge fairly easily on their own. Many teachers who might not be ready to shoulder the responsibilities of being the head coach might still be happy to help out as an assistant. This means someone who’s willing to help run practices in their room part of the time and who can attend tournaments on occasion (or in shifts) to help reduce the burden on the main coach. Perhaps the main coach could also work with the assistant to ensure that the assistant is ready to take over, should the main coach need to leave or retire. Parents are often happy to help with driving and chaperoning for tournaments. Talk to them as early as possible and bring your potential schedule for tournaments to them early in the year so that they can plan around that. You’re also more likely to find that your students take quizbowl more seriously if their parents also take quizbowl seriously. Parents can be especially helpful when running a tournament–they can man registration tables, sell concessions, help sort through scoresheets and packets, and do other helpful jobs for part of the tournament without needing much training. You may also want to start training a reading corps of parents who might be interested in coming back to read in future years, but this will take some time. 5. Have students keep track of and identify the tournaments that they can/want to attend. Planning the logistics for attending tournaments is a considerable chunk of time, but you can have your players help with that. All the information that you need to know about tournaments in your area is usually publicly available on NAQT.com, the hsquizbowl forums, or other local sites like GPQB’s regional schedule. Have your students keep track of what tournaments are upcoming in your area and which ones they would like to attend well in advance so that you can make the necessary preparations. This is also a good way for the students to practice figuring out a budget–how much funding do you have to work with, how much do you need to fundraise to attend these tournaments, etc. While of course the sponsor has the final say here and usually must work with the school administration to plan the trips, it definitely helps to have the students play a role in figuring out what tournaments they want to attend. This is especially important if you’re a new team or if there’s major changes in your school’s policies. Make sure that you know how to properly fill out a travel request form (if you have one), a reimbursement form (if you’ll need one), or any other documentation that’s required in your capacity as a sponsor. Check with your principal early about reserving the school for tournaments and clearing up any potential conflicts before the year begins. Your goal here is to reduce uncertainty as much as possible since changing the date of a tournament or having to deal with unexpected paperwork during the year can be rather annoying. It’s also a good idea to stay in touch with them throughout the year to keep them posted about how your team does and ensure they know how much you’re working. If you have an unusual situation or just a question about things, ask! Email several local coaches or members of a local quizbowl organization and see if they can help. The quizbowl community is usually quite willing to offer advice and tournament hosts might be able to do things to help your team (for instance, if you’re taking a train that gets in a few minutes after the start of the tournament, the tournament director could make sure your team gets a bye in the first round if that works with the format). The best thing that a coach can do is to give their team as many opportunities to compete as possible and to shape the culture of the team to be one of learning, support, and friendly competition. This doesn’t require that much of a time commitment overall, but it does require some upfront investment. This approach also allows students to develop more leadership and logistical skills on their own–something very valuable for their own development and good opportunities for the kind of leadership desired in selective college applications. 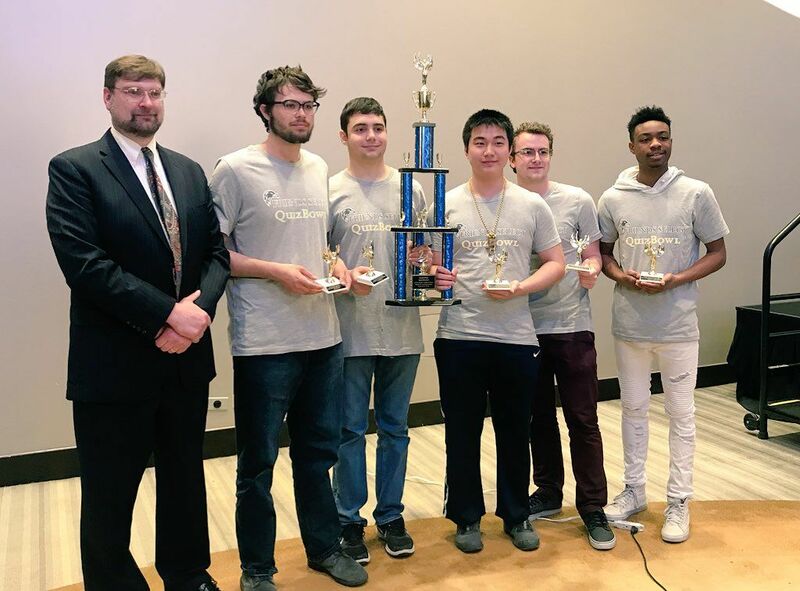 Last weekend, 11 teams from 9 Pennsylvania schools tried their hand at NAQT’s Small School National Championship Tournament (SSNCT), with some decidedly good results. For more information on the tournament itself, see our preview of the event from last week. The traditional public school division witnessed a truly impressive undefeated run to the championship from Glasgow High in Kentucky. Meanwhile, the PA teams acquitted themselves well to an exciting challenge. The highest finish (a 10th place-tie) went to Camp Hill, who extended their streak of top 11 finishes into an eighth season. Alex’s 18-power performance capped off his high school career with a bang, and Sydney led the team in scoring with 42.46 PP20 (Points per 20 tossups). They got to T-10 by winning a head-to-head match-up with Huntingdon A, who were in as impressive a form as they’ve ever been. Steady improvement since they joined the circuit three years ago has produced their best finish yet. Andrew led them in scoring, and as a 10th grader, was named one of NAQT’s rising stars for the event. While it’s a shame when a PA team has to eliminate another at nationals, both did well and should be proud of how far they got. South Side from Beaver County also made the playoffs, with a pair of thrilling wins against South Shelby and Pilot Grove, both from Missouri, in the final prelim rounds. This took South Side from 4-4 and on the ropes to 6-4 and into the playoffs. Both of those final wins were both by 20 points or less. Good clutch performances like these under pressure are a great confidence boost, and I hope South Side parlays this into even more next season. Outside the playoffs, Westmont Hilltop wound up just short at 5-5 with one of the best statistical performances from a non-playoff team. They did capture quizbowl’s hearts again with their second year of featured jamming with one player’s recorder on NAQT’s Instagram. Huntington’s B team also went 5-5, flaunting our expectations of them and showing the team might have sustained depth for years to come. Lakeland unfortunately finished 4-6, on account of their best player not making the tournament due to illness. While a disappointing finish for their best season ever, they still have lots to be proud of. Speaking of Northeastern PA, Riverside High also finished 4-6 and was the only Pennsylvania team that was completely new to pyramidal invitationals this year to attend this SSNCT. In their nationals debut, they performed solidly, especially their captain, Jake, with 34 PP20. It’s great to see them challenging themselves and we are happy to have them aboard the circuit. Winchester Thurston and Friends Select play an all-PA match. The biggest story from this year’s SSNCT for PA was unquestionably Philadelphia’s own Friends Select, who took home second place overall in the Open Division (Private and Charter and Selective Magnet schools). As teams seek to prepare for the later nationals in May, FSS looks to be peaking in fine form. Friends Select powered as many as 10 questions in one round, and got key contributions from a number of players. Saras, one of their fourth chairs, managed to power more than he 10’d, and Jake had the tournament of his life (to date) with several key powers in the playoff run. FSS was also the only team to defeat the tournament champion, Early College at Guilford (NC). This occurred in the first game of the finals (in which FSS had a disadvantage) after Friends Select had lost to ECG three times already. In a convoluted, multi-protest, very tense game that took almost an hour to complete (and can be viewed on YouTube here), the Falcons came out on top. While they lost the second game of the finals, they have so much to be proud of and made the eventual champions “go the distance.” Kudos to all five players as well as GPQB Coach of the Year Abbi Smith on a great performance. Not to be ignored behind them was a quite excellent Tie-5th place finish for Winchester Thurston. This longtime Pittsburgh powerhouse got there once again with their signature balanced attack, as all four players cleared 19 PP20. While their overall scoring averages would put them in line with teams than finished lower, Thurston continues to play scrappy and beat teams at any level, a trend from previous nationals. Moravian Academy sent two teams to the event and their A team made the playoffs with a 6-4 prelim record. They are steadily improving and look to continue even further next year. In yet another all-PA matchup, Thurston and Moravian met in their first playoff game, where the former triumphed 445-110. Friends Select with their second place trophy. NAQT’s President, R. Hentzel, is at left. SSNCT showed top PA small schools can flex their muscles; now it is time to see how their larger counterparts can handle the pressure next month at HSNCT.